What are the Different Ways to Immigrate to Canada from India? Canada is one of the incredibly popular and splendid immigrant destinations in all respects, whether we speak of tranquil ambience, quality of life, life expectancy, resplendent natural attractions, friendly and welcoming society, stunning landscapes, the attractive career as well as job prospects and many others. If you are a skilled professional and looking forward to Immigration to Canada, then you must be aware of the skilled visa options that are being proffered by the country and the extraordinary programs that are being promulgated by the Canadian immigration officials. With an intention to revamp the scope of immigration and fill the positions which the start-ups of the country are experiencing the shortage. With the rise in demand for skilled workers who possess special skills as well as abilities and a numerous number of employment opportunities, there is a steady rise in the count of overseas skilled workers choosing to immigrate to Canada. This Maple Leaf Country has active governance, well-paid jobs, social security, unparalleled immigration systems, all-around vegetation and greenery, natural resources and pleased evergreen ambience that would make a potential applicant lead theirs happily. Immigrating to Canada as a permanent resident remains one of the most sought after aspiration of many immigrants, as its immense competition at the workplace, fair economic policies, leading the life without any adjustments and an ample number of workable options to make a skilled applicant gain more pleasure in their livelihood. An overseas skilled worker planning for immigration to Canada from India has many visa options and ways to immigrate effortlessly. But a potential applicant must be able to decide which immigration program would best suit them and their family members. Ways to immigrate to Canada from India? Skilled worker and professionals: For applicants who meet the work and educational requirements and have the wish to settle and work in the country. Skilled trader: This is applicable for individuals who would like to reside in the country permanently and is granted only for an aspirant who qualifies in the assessment. Business Immigration: An overseas national who aspires to start a new business are permitted to make use of this visa option. All entrepreneurs, investors and self-employed applicants such as athletes, cultural contributors, farmers and artists can utilise this visa category. Provincial nominees: If you are nominated by one of the territories of the country, then you are allowed to settle and work in the country without any constraints. Apart from this, there are many ways to immigrate to your dream destination such as Quebec-selected skilled workers and business class, Canadian experience class, sponsorship programs and many others, if you meet the eligibility Criteria for Canada Immigration. 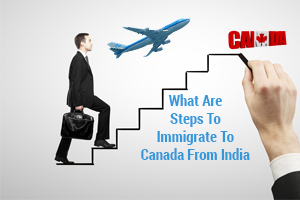 What are steps to Immigrate to Canada from India? Then submit the form and documents that are being recommended by the immigration advisors after the successful completion of the assessment.